The U.S. Chamber of Commerce and the American Trucking Associations put their proposals for higher gas levies before a House Transportation and Infrastructure subcommittee hearing March 7 exploring long-term funding for highways and transit, saying the cost of inaction is greater. The chamber has proposed increasing federal fuel taxes by 25 cents a gallon over five years or sooner and indexing it to inflation to raise an estimated $394 billion over the next 10 years, as part of a four-point plan that includes streamlining how permits are issued for projects. It would cost the average American about $9 a month, the chamber said. 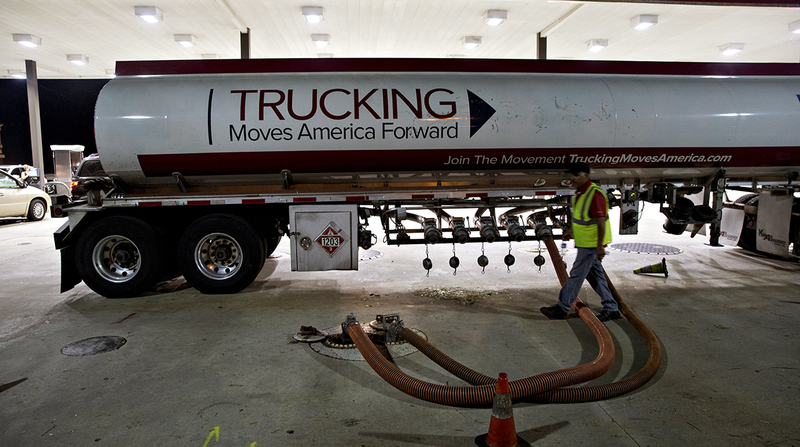 The trucking associations, a federation of state associations and industry councils that is the largest national trade association for the trucking industry, has proposed a “Build America Fund” [PDF] that would impose a 20 cent per-gallon increase in the wholesale fuel tax phased in over four years to generate $340 billion in a decade. Driving on bad roads costs U.S. motorists $120 billion a year in extra vehicle repairs and operating expenses – $553 per motorist, according to TRIP, a Washington research group. The trucking industry loses more than $63 billion a year from congestion, said Chris Spear, president and CEO of the American Trucking Associations. “We know that the price for this investment is small compared to all the benefits we’ll receive,” said Spear. industry loses more than $63 billion every year because of congestion on our highway system. Still, Republican lawmakers and anti-tax groups including entities affiliated with billionaires Charles and David Koch are opposing any increase. They argue it disproportionately affects rural, lower- and middle-income Americans, would undermine the tax cuts enacted last year, and isn’t needed if existing revenue is prioritized. The federal per-gallon tax of 18.4 cents on gasoline and 24.4 cents on diesel flow to the Highway Trust Fund, which pays for road, bridge and transit projects. But the taxes haven’t been raised since 1993, and inflation has robbed 40% of their purchasing power while fuel economy has increased and there are more electric vehicles that don’t pay. Outlays from the trust fund have exceeded revenue since 2008, forcing Congress to transfer billions of dollars from other sources. The fund will become insolvent by fiscal 2021 without more money, according to the Congressional Budget Office. Senate Democrats on March 6 released a plan to finance $1 trillion for infrastructure by rolling back key portions of the Republican tax cut package passed last year, including restoring a top individual tax rate of 39.6%, raising the top corporate tax rate to 25% from 21%, and increasing taxes for so-called “carried interest” for hedge fund and private-equity managers. The plan, they said, would help bolster funding for roads and bridges, while also financing other public-works needs including $40 billion over 10 years for improved internet access in rural areas. Senate Minority Leader Chuck Schumer said 10 million jobs would be created under such a plan. He said Democrats won’t back Trump’s more limited approach. “The plan they unveiled doesn’t come close to giving America what it needs,” said Schumer at a press conference in Washington March 7. Instead, the Trump plan would leave Americans paying higher tolls to private developers, and give little incentive for construction companies to build infrastructure in low-traffic rural places, he said. Sen. Patrick Leahy of Vermont, the top Democrat on the Senate Appropriations Committee, said Trump’s plan can’t get the 60 needed votes in the chamber to become law. “The Trump plan is flim-flam and fumes, and it’s not going to go anywhere,” he said. Sen. John Barrasso of Wyoming, chairman of the Environment and Public Works Committee who has called raising the gas tax “a non-starter,” said the answer isn’t raising taxes. “If Chuck Schumer and the Senate Democrats spent more time working with Republicans on infrastructure and less time thinking of new ways to raise taxes on hard-working Americans, we would be making more progress,” Barrasso said in a statement.